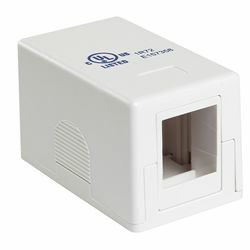 Keep your wall surface-mounted connections flexible with a reconfigurable jack box. It can attach to the wall by sticky pad or screws, both included. Run your cable through the back or the bottom. The main slot accepts any standard keystone jack, so you can choose and change the type of port the box holds. Requires keystone jack, not included.